SEVILLE CONDOMINIUM TRUST v. THE SEVILLE ON BOSTON HARBOR, LLC, and MDJ ENTERPRISES, LLC, d/b/a BEACON HILL ATHLETIC CLUB. MEMORANDUM AND ORDER ON THIRD-PARTY DEFENDANTS' MOTIONS TO DISMISS THIRD-PARTY COMPLAINTS. MISC 18-000321 : SEVILLE CONDOMINIUM TRUST v. THE SEVILLE ON BOSTON HARBOR, LLC, and MDJ ENTERPRISES, LLC, d/b/a BEACON HILL ATHLETIC CLUB, v. MATTHEW CLENNEY, SARA PETRIE, and ZACHARY BRYDEN, Individually. In the second to be filed of these consolidated cases, the defendants The Seville on Boston Harbor, LLC ("SBH") and MDJ Enterprises, LLC, d/b/a Beacon Hill Athletic Club, ("BHAC") each filed a third-party complaint, naming as third-party defendants the three Trustees of the plaintiff Seville Condominium Trust ("Trustees"). These Trustees authorized the filing of the present consolidated actions and an earlier action in the Superior Court that was voluntarily dismissed. Both of the third-party complaints plainly state claims for the tort of abuse of process. In addition, the third-party complaint filed by SBH contains a second count alleging a breach of fiduciary duty by the third-party defendants to SBH in its capacity as a unit owner at the Seville Condominium. 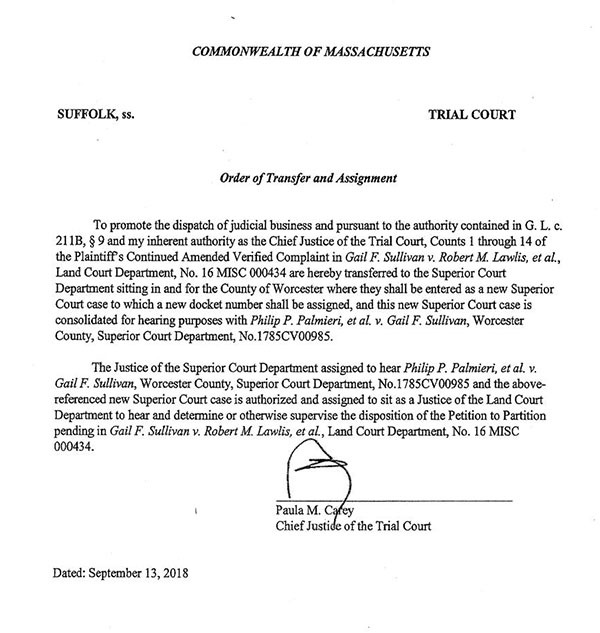 The third-party defendant Trustees filed motions to dismiss, pursuant to Mass. R. Civ. P. 12(b)(l)-the abuse of process counts contained in both third-party complaints-on the ground that the Land Court lacks subject matter jurisdiction over abuse of process claims. The Trustees also moved to dismiss, pursuant to Mass. R. Civ. P. 12(b)(6), the breach of fiduciary count in SBH's third-party complaint. SBH informed the court at the hearing on the present motions to dismiss that it has waived its count for breach of fiduciary duty and agrees to the dismissal of that count. Thus, the sole remaining counts left for consideration by the court are SBH and BHAC's abuse of process claims. In reviewing a motion to dismiss for lack of subject matter jurisdiction pursuant to Mass. R. Civ. P. 12(b)(l), the court accepts as true the factual allegations in the complaint, as well as any favorable inferences reasonably drawn from them. Ginther v. Comm'r of Ins., 427 Mass. 319 , 322 (1998). In considering subject matter jurisdiction under this rule, the court may consider matters outside the four comers of the complaint, which are used to support the movant's claim that the court lacks subject matter jurisdiction. Id. at n.6. All parties agree, as they must, that this court has no statutory jurisdiction over claims of abuse of process. The Land Court generally has jurisdiction over actions involving a right, title or interest in land, as more specifically provided in G. L. c. 185, § 1. "Abuse of process" is a claim sounding in tort. "The essential elements of the tort of abuse of process are '(1) process was used; (2) for an ulterior or illegitimate purpose; (3) resulting in damage.'" Vittands v. Sudduth, 49 Mass. App. Ct. 401 , 406 (2000), quoting Kelley v. Stop & Shop Cos., 26 Mass. App. Ct. 557 , 558 (1988). As the parties have acknowledged, the Land Court has, on numerous occasions, dismissed claims for abuse of process on jurisdictional grounds. See, e.g., Rivera v. Venditto, Jr., 22 LCR 187 (2014) (Scheier, J.) ("[C]ounterclaim for abuse of process is dismissed without prejudice, due to the Land Court's lack of subject matter jurisdiction of that count. "); Chew v. Kwiatkowski, 19 LCR 88 (2011) (Trombly, J.) (abuse of process, G. L. c. 93A, and nuisance counterclaims dismissed for lack of subject matter jurisdiction). Nevertheless, SBH and BHAC, citing Sullivan v. Lawlis, 93 Mass. App. Ct. 409 (2018), argue that the court is obligated to request or accept an interdepartmental assignment to hear the abuse of process claims. SBH's and BHAC's reliance on Lawlis is misplaced. In Lawlis, a judge of the Land Court granted summary judgment dismissing a partition action filed pursuant to G. L. c. 241, based on the judge's determination that there was no genuine issue of material fact that would allow a finding that the subject property was owned by the parties as tenants in common rather than in a partnership. Having determined that the property was owned by a partnership, the judge dismissed the action because the court has no jurisdiction to partition property owned by a partnership. G. L. c. 241, § 4. The Appeals Court vacated the judgment not because the judge had erred in failing to accept jurisdiction, but because the Appeals Court determined that "genuine issues of material fact preclude a conclusion that the property is held by the parties in partnership as a matter of law." Id. 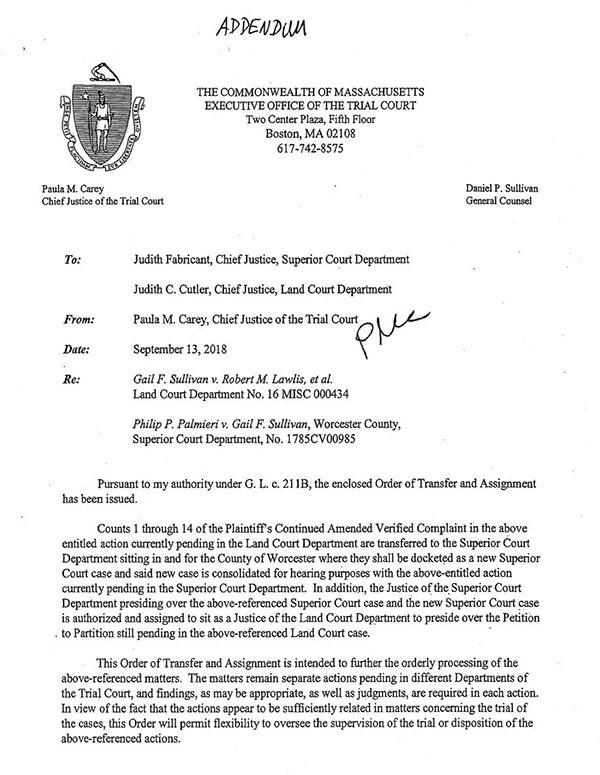 The Appeals Court also took note of the unusual nature of the case, noting that either a Superior Court judge or a Land Court judge would have to receive an interdepartmental designation to hear the case, since a determination that the property was held by a partnership would leave the Land Court without jurisdiction, and a determination that the property was held by tenants in common would leave the Superior Court without jurisdiction to hear the G. L. c. 241 partition action. As a result, following remand, the case was in fact transferred to the Superior Court, and a Superior Court judge was authorized to sit as a Land Court judge to hear the case. See Memorandum and Order of Transfer and Assignment, September 13, 2018. [Note 1] The facts in Lawlis are thus distinguishable from the present case, as it is not necessary in the present case to adjudicate the abuse of process clams in order to reach the merits of the remaining claims in the case. Accordingly, the court is not obligated under the holding of Lawlis to request or accept an interdepartmental designation in order to hear the abuse of process claims alleged in the third-party complaints. Nor does the court believe that this is an appropriate case for the court to accept jurisdiction by way of an interdepartmental designation as a matter of discretion. "Absent statutory provisions that repose exclusive original jurisdiction over a claim in another court, '[w]here the parties have been brought before a court of competent jurisdiction, their controversy so far as practicable ought to be completely and finally disposed of.'" Ritter v. Bergmann, 72 Mass. App. Ct. 296 , 301-302 (2008). In Ritter, the Appeals Court held that the Land Court had jurisdiction to award damages on a tort-based theory "where damages are ancillary to claims related to any right, title, or interest in land." Id. at 302. In the present case, unlike Ritter, the abuse of process claims are not ancillary to the claims of right, title and interest in the underlying case, and importantly, proof of the non-jurisdictional tort claims is not so intertwined with the underlying facts of the case as to be susceptible to more efficient adjudication as part of the same case. Proof of the abuse of process claims will require significant additional testimony (and discovery) unrelated to the parties' claims concerning whether the fitness club in unit 003 generates excessive noise and vibration in violation of the Seville Condominium governing documents. The court is reluctant to so broaden the scope of the trial as to include otherwise unnecessary and unrelated testimony concerning, for instance, the motives of the Trustees in filing the present or previous actions. Based on the request of SBH at the hearing on the present motions, and based on the other parties' lack of opposition to that request, Count II of SBH's third-party complaint is hereby DISMISSED WITHOUT PREIDDICE pursuant to Mass. R. Civ. P. 41(a)(2). For the reasons stated above, the third-party defendants' motions to dismiss the remaining abuse of process counts are ALLOWED, and defendant SBH's third-party complaint, and BHAC's third-party complaint, are DISMISSED WITHOUT PREIDDICE for lack of subject matter jurisdiction pursuant to Mass. R. Civ. P. 12(b)(1). Judgment will enter accordingly upon the conclusion of the litigation of the remaining claims in these consolidated cases. [Note 1] A copy of the Memorandum and the Order of Transfer and Assignment is attached hereto.